Review Rate Card of City Times advertisement to book your ad in Times of India Delhi Newspaper. The rates of City Times advertisement are mentioned in Rupees per square centimeter. To get the total cost calculate the rate with the size of advertisement you wish to advertisement in Times of India newspaper. Don't forget to check the booking essentials to know about the City Times advertisement publishing date, booking deadline and other mechanical details of Times of India Delhi Newspaper which helps you to plan your schedule according. You can give Full Page, Half Page, Quarter Page or any other size advertisement for Front Page, Back Page, Page 3 or in inner page of Times of India Delhi newspaper. Publishing Days All Days, Every week. Booking Deadline Book your Ad in City Times atleast 3 days prior to the release date. Proof of Execution Once your Ad is released a soft copy would be shared with you within 3 days of release. 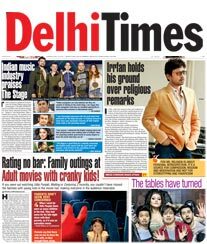 How to book City Times Ad in Times of India Delhi Newspaper? Check the rate card of City Times advertisement and fix the size according to your budget for Times of India newspaper. Plan schedule for your City Times advertisement by checking booking essentials mentioned for Delhi edition. Prepare a draft of your City Times advertisement content and send us to avail a free quote along with various discounts and offers available for Times of India newspaper for its Delhi edition. Upon receiving your consent on the Ad Rates quoted to you for City Times advertisement for Times of India, we will send you an invoice with every payment options available. Once the payment is received, our designing team would start designing your City Times ad as per your requirements and it will get published on the date chosen in Delhi edition of Times of India newspaper. We are a national Advertising Agency and our clients are based all over India. Therefore we do bulk media buying from Times of India newspaper for City Times advertisement so that we can offer our clients the lowest rates even for small budget releases. We have effectively presented this information on our digital platform by which anybody can understand City Times advertisement rate card easily. This has become a great tool for advertisers to plan media in an effective manner while saving cost on advertising in Times of India to get best the milage on spendings for Delhi city.